I can relate so much even by just looking at the cover. Very heartwarming and touching book. I had a lump in my throat nearing the end of it. Even my 6-yr. old son was touched. No matter if your house looked like a jungle, how much spit, poop and food you had on your hands, how much milk, spag and juice spilled in your couch, how many times your child disobeyed you and you hated yourself for being terribly mad, how much brawling your kids had with each other that it's such a headache...at the end of the day, you look at your sleeping kids and feel that you just love them. I couldn't agree more, very well said. My Mommy Moments, have a great weekend. i bought that book for a price.. but i saw copies of it at BookSale not so long ago. that is a must read for all moms! 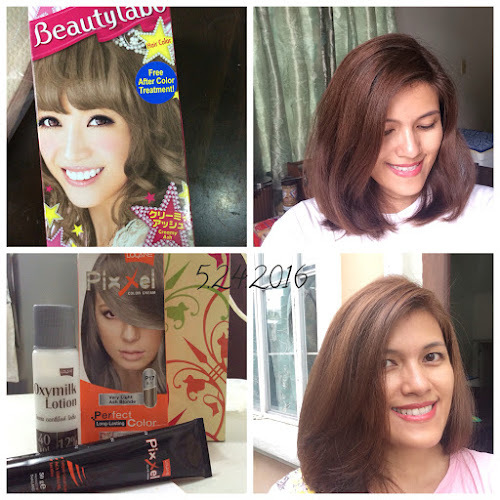 Two weeks ago, I dyed my hair in Creamy Ash by Beautylabo. Kaya pala, anlabo nila e. Hehe. The result that you see above is from two weeks after I colored my hair. That's how it looks in bright light. Quite far from the one in the box isn't it. I want my hair to be even more ashy. So today, I colored my hair again with Lolane Pixxel in Very Light Ash Blonde.I always choose ashy tones as I hate orangey or reddish in my hair. The pic in the last frame is the result under natural light. A bit orangey for my taste. I was hoping for a more greyish tone. It's nicer in different lighting, though. The color in this pic is closer to the one I'm rooting for. Had a successful trip to Divisoria last Saturday. I didn't expect that Divisoria Mall is a haven for party goods, toys and giveaways for birthdays. Bought these bags for P12. Then I saw a stall in the second floor that makes personalized badges or pins. 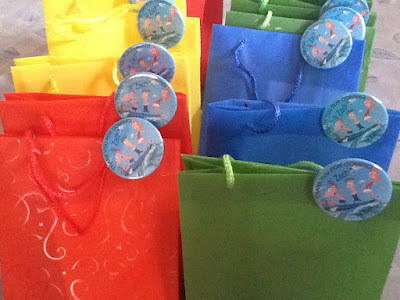 I just figured out it'll serve it's purpose as a pin and cute accent to the loot bags when I was already assembling the giveaways inside the bags. Hubby says the badge is pricey for P10. 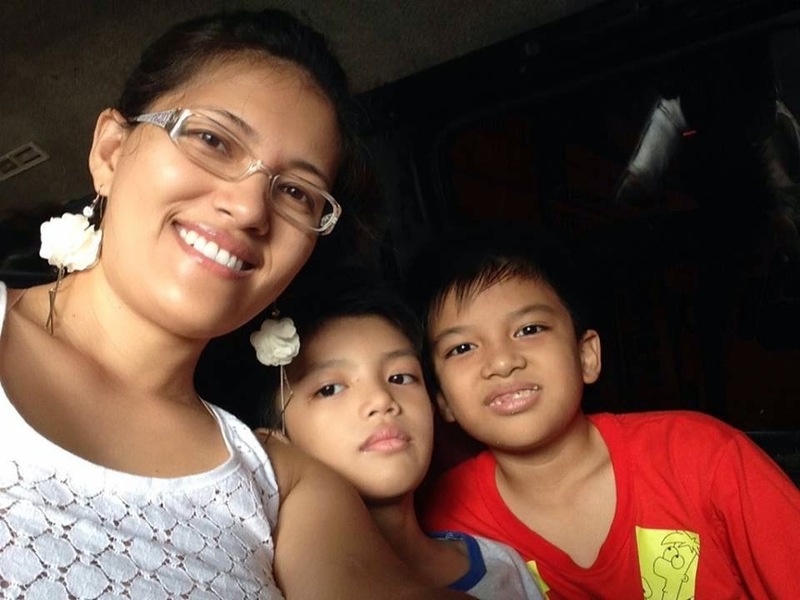 It's our first time to go to Puerto Galera via commute with the kids. I and hubby went there before for our honeymoon via Coco Beach Express so no hassle. But this time, surprisingly, getting to Puerto Galera from Biñan, Laguna via commute is fairly easy as well. So, here's how we did our commute: 1. We rode a jeepney from National Hi-way going to Sta. Rosa, Balibago Complex. 2. In Balibago Complex terminal, we rode a van going to Batangas Pier. These vans are the ones parked beside the buses going to Alabang. This is the bus terminal in front of Jollibee between Target Mall and Mercury Drug. It took us a long 30 minutes to wait for passengers to fill the van but the travel is quite fast at only 2 hours from Sta. Rosa to Batangas Port. Fare is P130/person.